Agave spicata ( Cavanilles 1812 ) in flower. Article from the Dutch society Succulenta. In past times a flowering agave was quite an event, enough to be reported on in newspapers. 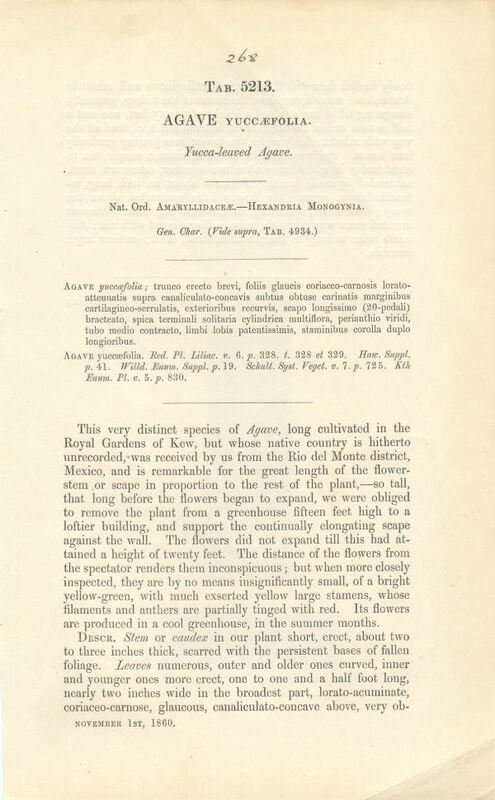 In an old issue of Succulenta from May1942 there is a picture of an agave americana in flower with a greenhouse constructed around the flower stalk so that the inflorescence can develop to it’s maximum potential prior to winter. Of the bigger plants it is usually the large agave americana that are to be found in flower. These plants are normally too big for average collections. Most growers don’t like these plants anymore after a few years. Always every season before the winter comes plants need to be removed under cover and in spring brought out again and the bigger they get the less pleasant the task. In the last few years enthusiasts have been delighted to find many new species of smaller agaves , plants which are able to flower in a much shorter time scale. A good example of this is agave spicata. The flowering of an agave is always a spectacular event. Although this usually means the death of the mother plant, it also means new agave life in the form of seeds, bulbils on the flower stalk and offsets around the base of the dying plant. When studying the literature one doesn’t often see a variety of flowering agaves, logical because the agave flowers only once during its existence. Most of the time you see pictures of flowering agaves from the same species as americana, parrasana and filifera. In past times each plant was a prized possession. When an agave was started to flower beautiful hand-coloured drawings of the plant were often made. Consequently, in older drawings, the plant was always portrayed with its flower. In Howard Scott Gentry’s epic work ‘ The Agaves of Continental North America from 1982 you can see a lot of these old drawings of agaves, unfortunately however in black and white only. 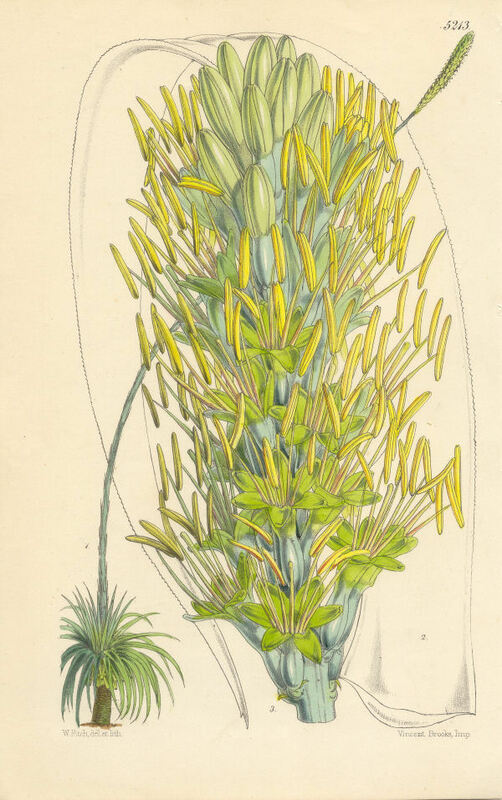 Agave spicata has featured a number of times in this type of illustration. In the castle of Malmaison, 8 km North of Paris, are to be found two nice hand coloured drawings of this species by the famous J.P.Redouté, who was working from 1798 for Josephine Bonaparte , the wife of Napoleon. They were produced with a specific technique to make the flowers look very real. We present in this article the two drawings created in 1811. The quality of these drawings is so stunning that even the best digital cameras would struggle to match it. The detail of the flowers is exquisite and it must have taken amazing patience to produce something like this. Although people had shorter lives in those days they seemed to have more time to create works like this. In our digital world we have the means by which we can easily recreate beautiful pictures simply by copying from sources such as the internet, thus showing the style of a bygone era. 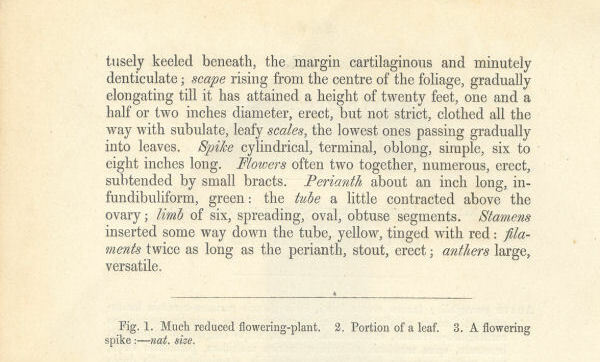 We also present from the famous Curtis Botanical Magazine a nice drawing from 1860 showing a flowering plant of agave spicata in Kew Gardens, London, England. In this particular drawing that we show you here, you can see that the plant has an stem. This is an unknown event in cultivation It would appear that, because this plant has the appearance of a yucca and it’s original name was agave yuccaefolia, the artist felt a stem was appropriate and so added it to his work. The first picture as such of agave spicata was black and white and came from an article by August Breitung in the Cactus and Succulent Journal of 1960, page 182. The native habitat of this plant is still unknown. Several authors, including Gentry, quote Actopan and Real del Monte, site of a large mine near Pachuha, Hidalgo. This site is quoted as a source of a number of agave introductions into Europe,probably reflecting the high level of activity there in those times. Gentry was not able to find the plants at that location and indeed the habitat as yet waits to be discovered. Julia Etter and Martin Kristen, the well known swiss couple travelling around Mexico in their “ Poco Loco” ( four wheel drive car) and filming and recording the flora, are actively looking for the habitat. Agave spicata was known until 1995 under the name of agave yuccaefolia. Bernd Ullrich, a german agave specialist alas no longer active , discovered that for this species the name spicata had preceeded yuccaefolia and so the latter was no longer valid. The original description was in 1802 by Cavanilles from the botanical garden of Madrid. Agave spicata does not have the typical appearance of an agave and looks more in fact like a Manfreda. The species does not have a strong end spine and is toothless. Quite unique are the so called bloodspots on the leaves , nice red/green spots more common in the Manfreda family. Because the plant doesn’t have a tuberous stem it is classified as one of the agave family. It is placed in the monotypic section Yuccafoliae. The plant is usually easy in cultivation and will often start to flower after only 5 years. In 1860 Durpuis published a drawing showing the seeds of the species grown by Mr. Cels in Paris. We have not had seeds from our plants Maybe for the first time we show you now the flower and the plant in colour! Breitung,A.J. (1968) . The Agaves . The Cactus and Succulent. Journal Yearbook. Abby Garden Press. Eggli, U. (2001) : Sukkulentenlexikon Band 1. Einkeimblattrige Pflanzen (Monocotyledonen). Stuttgard. Garcia-Mendoza, A. (2002): Distribution of Agave (Agavaceae) in Mexico. C&S.J. (US) 74 (4):178. Gentry, H.S. (1982) Agaves of the continental North America – The University of Arizona Press, Tucson. Irish, M.& G. Irish (2000) : Agaves and related Plants – A Gardners Guide – Timber Press Portland Oregon. Thiede, J. (2001): Agavaceae – In Eggli, U. :Sukkulentenlexicon Band 1, Einkeimblättrige Pflanzen. (Monocoltyledonen).- Verlag Eugen Ulmer, Stuttgart. Ullrich, B. La questione della priorita di Agave spicata Cavanilles su Agave yuccafolia F. De La Roche in Redoutė(patel) in Piante Grasse 1995. Vol. 15 : 4. decembre.pag 115-123. Vol.16 no.1. 1996 pag.23-29. 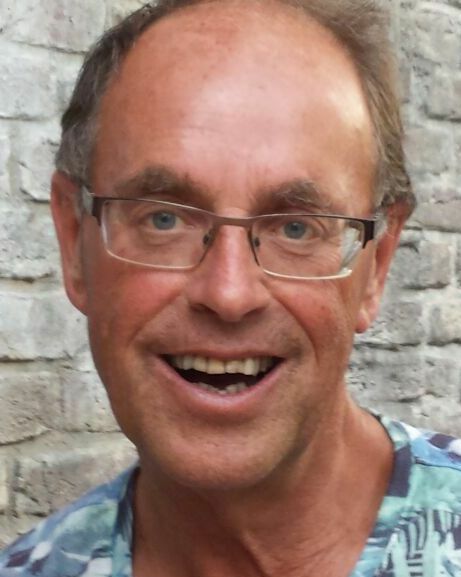 Wagenaar Hummelinck Dr.P. Agave americana bloeiend in Nederland. Succulenta Vol.24. 5. 1942 pag.51. Under: Painting from 1802 by J.A.Cavanilles from "Hortus Regius Matnitensis, T.28 Madrid.